Popa Chubby (born Theodore Horowitz) who hails from the Bronx, New York played The Pot as part of a short UK/Europe tour in support of the new album The Catfish. Chubby started out playing the drums as a young teenager before switching to guitar. Horowitz has recorded at least nineteen studio albums and has released a few live recordings in a career spanning twenty-five years. He is relatively unknown in the UK outside of the Blues community, which is a shame because he is a gifted musician who writes intelligent and some tongue-in-cheek songs. Chubby's approach to guitar playing is at times flashy then restrained playing both lead and rhythm parts. He grew up listening to Hendrix, Clapton, Cream, the Rolling Stones whose influences are apparent. Also the Punk Poet Richard Hell whom he backed many years ago seems to have rubbed off on him. Elements of Stevie Ray Vaughan and Billy Gibbons (ZZ Top) are also apparent in his guitar playing. Right from the start Popa owned the audience and had them involved throughout the gig, singing and clapping along to some of his songs when encouraged. Highlights of the show were superb cover of Bye Bye Love, a moving instrumental called Blues For Charlie dedicated to the magazine journalists of the Parisian publication after the terrorist attack in early 2015, Working Class Blues and The Catfish, the title track of his latest album. The gig finished with a call and response display from Chubby and his drummer when they both played the same drum kit during the final song of the night, this was something not seen before and was very impressive. Popa Chubby and his band played a set clocking in at two hours and fifteen minutes and the time flew by. Not only is Chubby a talented musician, he is a funny man who came across as very likeable. 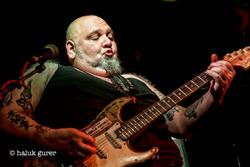 If you missed this please keep an eye out for future Popa Chubby gigs and support him. You will not regret it.